There is a strong and diverse music program in 2016, including big names such as Sleater Kinney, Colin Hay, Kate Cebrano, The Black Sorrows, iOTA, and Kate Miller-Heidke. 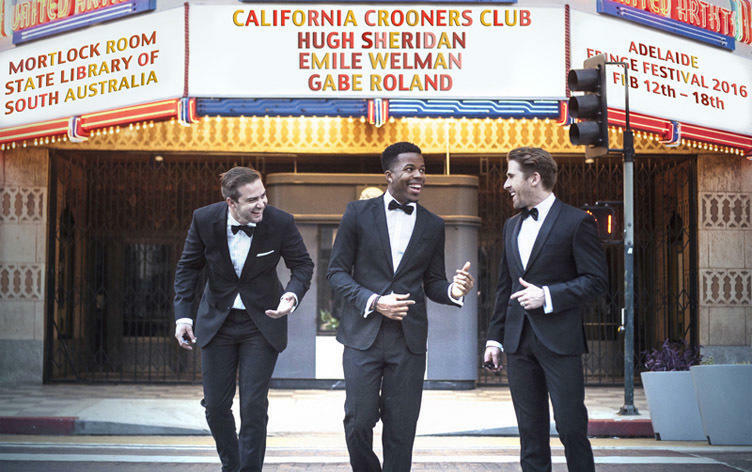 The must-see music event of 2016 will be California Crooners Club with Hugh Sheridan, which will see the Adelaide native combining jazz classics with swing versions of modern hits – think Sinatra meets Sia. Local acts to check out are The Germein Sisters, Max Savage and Louise Blackwell. A special event not to be missed is Massaoke; a singalong clubbing sensation sweeping the UK by storm. Circus lovers are in for a treat with Barbu Electro Trad Cabaret from Canada, which plays dangerously on the borders of modern circus and pushes the limits of good taste. There’s also Fuego Carnal, The Pianist, and the amazing Fringe favourite Luminous. To discover the new generation of circus performers, try Betwixt by Point & Flex Circus, Perhaps There is Hope Yet by Company Here and Now and Les Femmes Circus by Les Femmes Circus. In theatre, don’t miss Echoes, written by internationally acclaimed playwright Henry Naylor. New York’s undisputed queen of the underground, Penny Arcade will return to Adelaide with Longing Lasts Longer. There’s also Beowulf: The Blockbuster, Hart and Bruce. Beautiful Words from South Australian Youth Arts, which received an Adelaide Fringe Cultural Fund grant, will have its world premiere at the 2016 Adelaide Fringe. The brand new interactive genre has events that promise to wow and amaze, with virtual reality wonders and digital manipulation aplenty. Adelaide-based Felicity Arts will invite audiences to enter a world of possibility and mystery with Otanical, in the beautiful setting of the Adelaide Botanic Gardens. The Digital Playground at the State Library of South Australia will be home to The Cube from Google’s Creative Lab, which will see 6-sided stories brought to life, while those suffering from March Madness can take a break with Hammocktime. All the big names in comedy are back this year, including favourites such as Danny Bhoy, Judith Lucy, Sam Simmons, Dave Hughes, Wil Anderson, Stephen K Amos, Tessa Waters and Hannah Gadsby. Adelaide Fringe Ambassador Julian Clary will also treat Adelaide audiences to the world premiere of his new show, The Joy of Mincing. Those with children will be spoiled for choice, with many seasoned performers presenting children’s shows in 2016. The critically acclaimed Le Gateau Chocolate will present Duckie, the boys of Briefs have more family-friendly fare with Brat Kids Carnival and comedy favourite Frank Woodley will ham it up in Noodlenut. In cabaret, local talent abounds with Michaela Burger presenting the award winning Exposing Edith, Michael Griffiths paying tribute to the life of Cole Porter in Cole and Adelaide treasures Hans and Willsy celebrating their similarities in Hans & Willsy: Twins. Adelaide Fringe Cultural Fund grant recipient Leah Shelton will celebrate 1970s ‘Ozploitation’ films in PULPSHOW; a wild, irreverent, hyper-physical mix of dark comedy, anti-burlesque and cynical pole dance. Finally, the award winning Ruth Wilkin will pay tribute to tribute shows with the aptly titled Tribute. Magic lovers will be well catered for in 2016, with the new magic genre in the program featuring Matt Tarrant: Honestly Dishonest, and other highlights Comedy Hypnosis! Entranced and Minor Miracles. Film buffs should get along to the Ka-ching! and the Fringe Pilot Film Festival. In dance, don’t miss African Show Boyz, Flamenquendo’s Tablao and the Tesaa Cultural Troupe. In visual art, Emma Hack – New Works, the Emma Hack Art Prize, Border Crossings, Grit, and Instagram favourite WTF Renaissance are all must see exhibitions. Other events not to be missed are An Evening with Annabel Crabb, the Little Rundle Street Street Party, the Salisbury Secret Garden and the Central Market Challenge.